I did not feel Christmassy at all last year. We managed to put up some outdoor decorations, but inside, our home looked the way it always did. It reminded me of people who put on a brave face when they go out in public but are just a mess when they’re by themselves. In retrospect, our lovely home mirrored what was going on with me, outwardly jolly while inwardly rocking in a corner as Christmas approached. Part of my problem is that I feel my brother’s absence most acutely at Christmas. He was our Santa and took great joy in getting the right gifts for people. He was the one who wore the elf hat to pass out presents to everyone on Christmas mornings. And even though I no longer cry every time I think of him, even though I now picture him healthy and happy when he flits through my mind, it’s still difficult to navigate the holiday season without him. I’m feeling better this holiday season. Less sad and more excited about the holidays. Looking forward to being with the people I love who are still here with us rather than continuing to mourn those who have passed on. As part of this more positive outlook for Christmas 2015, The Beloved brought down all the Christmas Items from the attic last night, and we’ve even decided to buy an experimental tree to see if the children will leave it alone or if it will just be more than their little kitty hearts can take. We figure we’ll add some unbreakable ornaments and just see how it goes. This is huge for us, because we’ve not had a tree since we got our first cats in 2009. This will be the first Christmas tree we’ve put up since we’ve been back in North Carolina. I will keep you posted on how things go. 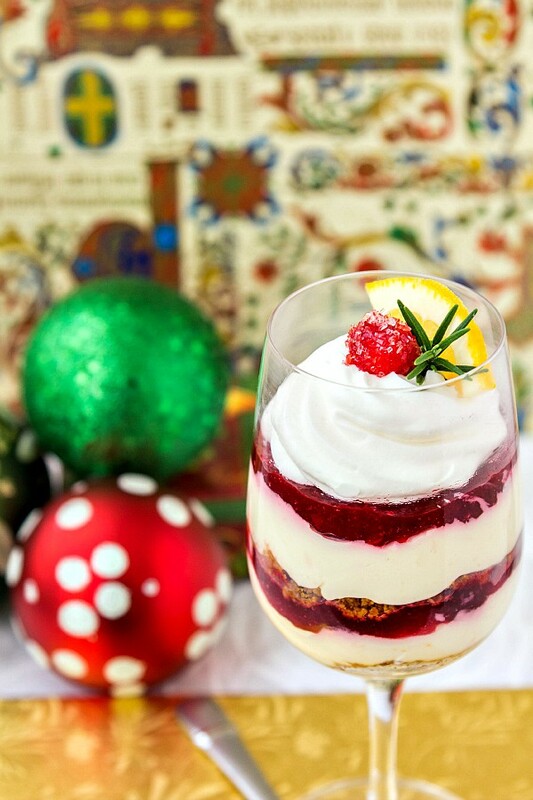 As part of my new attitude towards all things Christmas, I have made you a most festive dessert indeed. And it’s easy to make. The cheesecake has huge orange flavor from four different orangey sources, so no more insipid orange cheesecakes friends. This one makes you stand up and take notice. 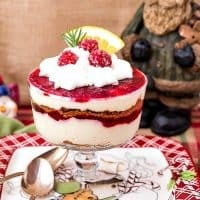 I balanced the sweet orange cream layers with tart cranberry sauce. I just used what was leftover from Thanksgiving, and you can do the same. Use your favorite homemade sauce or even use the canned kind. Just give it a good stir and you’re in business. I added some crunch with a crunchy gingersnap crumble. While I could have just crushed up gingersnaps and called it a day, I find that crushed cookies get soggy quickly. If that’s what you’re going for, by all means carry on, but I like my cookie crunchies to stay crunchy. Mixing the crumbs with some softened butter and then baking the whole thing like you would for a graham cracker crust is just the ticket. The fat coats all the little crumbs and keeps them nice and crunchy for a good two or three days–plenty of time for you to polish off these bad boys. And because I am feeling festive this year, I’m sharing three different Serving Suggestions with you. 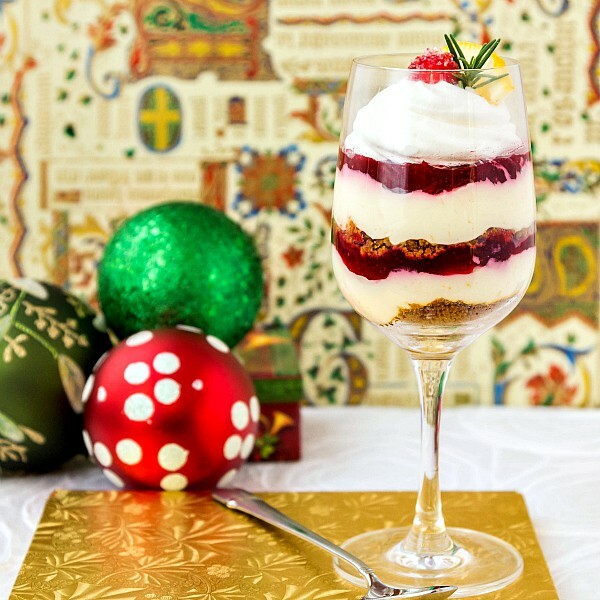 Serve the no bake orange cranberry cheesecake parfaits in wine glasses. Here your serving size is about 8 ounces. A big dessert, but not ridiculously so. And serving dessert in wine glasses just looks so fancy. Here I used my individual trifle bowls. They hold 12 ounces, and as you can see, they are filled to the brim. This definitely falls under the Desserts to Share category. You could also make the layers thinner and still have room in the bowl. That way everyone could have their own dessert of about 6-8 ounces. Still, sharing is fun, and this photo makes me think of cozy log cabins at Christmastime. I suggest you share yours with someone you love in front of the roaring fire. This is the super swanky apartment-in-Manhattan-overlooking-the-park option. The very cool angled presentation is pretty slick, no? So easy, too. The fillings aren’t runny, so all you have to do is tilt your glass and use a spatula to smooth out the first layer before spreading on a bit of the cranberry and a sprinkle of gingersnap crumble. 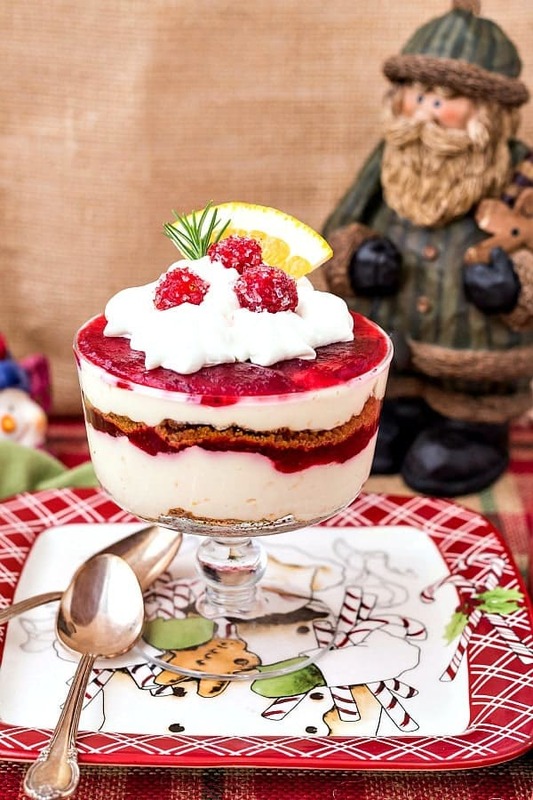 Rather than 2 full layers of cranberry, this presentation gets a small sort-of-quenelle of cranberry on top. These glasses hold 6 ounces. For all three options, I just garnished with lightly sweetened whipped cream (cream, powdered sugar, salt, vanilla) and some sugared cranberries. Those are really easy, too. I just thinned out some of my cranberry sauce with a bit of water, dunked my cranberries in and then rolled them in clear and red decorating sugar. They’re very festive. Each guy also gets a quarter of a thinly sliced round of orange and just the tip of a branch of rosemary. Any and all of these garnishes are optional, and you can also throw caution to the wind and come up with you own garnish ideas. 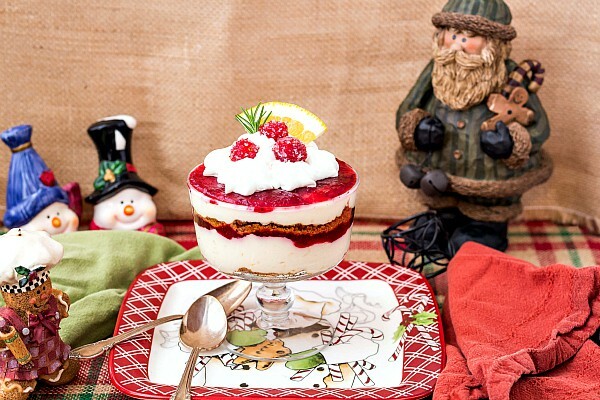 And now, I’ll just be quiet and tell you how to make your own no bake orange cranberry cheesecake parfaits. These no bake orange cranberry cheesecake parfaits are made with leftover (or your favorite) cranberry sauce and a simple gingersnap crumble made of gingersnap crumbs and butter baked at 350F for 10 minutes. Fancy, but so easy to make. In the bowl of your stand mixer, beat the cream cheese until smooth, scraping bowl as necessary, about 2 minutes. Add the orange juice concentrate, granulated sugar, orange zest, orange liqueur, orange oil or extract and salt. Beat until completely smooth, scraping the bowl and the paddle as necessary. Set aside. In another bowl, whip the cream and vanilla to medium peaks. Whisk a third of the whipped cream into the orange mixture to lighten it and then fold in the rest of the cream until there are no streaks remaining. Whir the cookie crumbs up in your blender or food processor until they're mostly fine crumbs. A few bigger pieces are fine, but you don't want any huge cookie chunks. Add the butter and pulse until the crumbs start to clump together. Scrape out onto a Silpat or parchment-lined cookie sheet and bake at 350F for 10 minutes. Remove from oven and cool completely, Crush into crumbs. You can do this any way you see fit, but for the wine glasses and the trifle glasses, I started with a handful of crumbs spread out evenly. Then I carefully added some orange cream, sort of pressing it in place rather than spreading it because I didn't want the cookies to get pulled up and into the cream layer. Once the orange layer was smooth, I added a thin layer of cranberry sauce. I repeated the layers once more, chilled for a good 4 hours and then garnished. **If your favorite cranberry sauce is really chunky, heat it up and either run it through the blender or press it through a medium sieve. You want relatively smooth sauce for pretty layers. You can now also download a pdf of this recipe on my new cute-as-a-button holiday recipe cards. Click on the photo below! 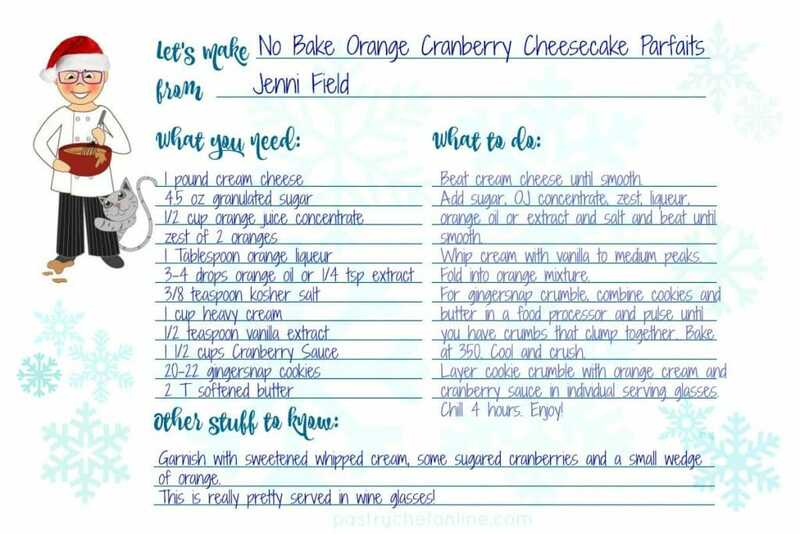 Here are some of my recommendations for equipment and ingredients you’ll need to make these no-bake orange cranberry cheesecake parfaits. Thanks for shopping through my affiliate links and helping me keep the lights on here at PCO headquarters. Please note that while the wine glasses are exactly the same as pictured here, the trifle bowls and small glasses are not. I just wanted to give you some similar options. 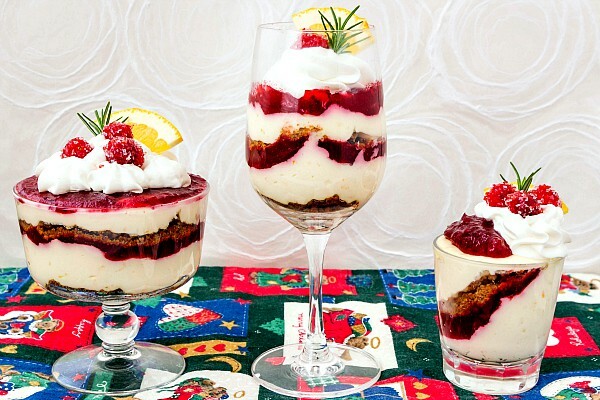 I hope you enjoy these no bake orange cranberry cheesecake parfaits. They are super orange-y and wonderful. The crunch and zing from the gingersnaps and the sweet tart cranberry sauce both complement the orange beautifully. Enjoy. I hope you are feeling Christmasy this year, but if you aren’t, I get it. And it’s okay. Or at least it will be. 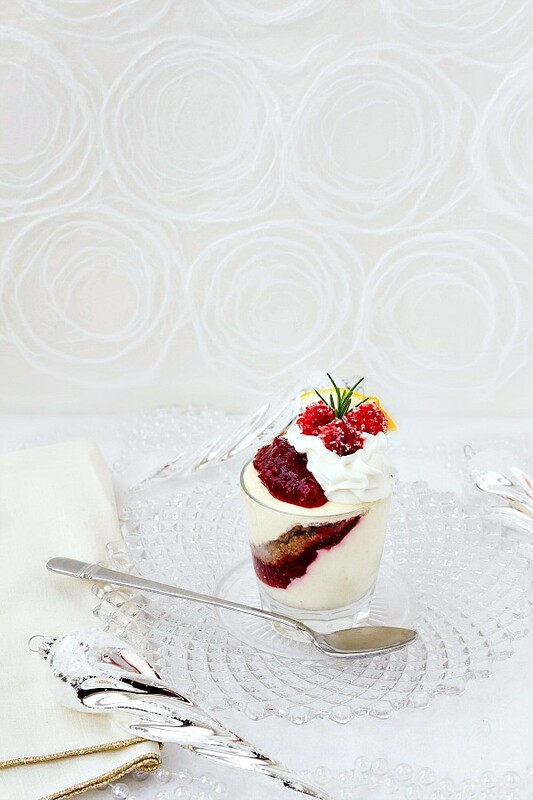 I just love the flavor palate and the simplicity of these parfaits! I think that a Trader Joe’s Triple Ginger Cookies will be perfect to crumble into the layers. This will make an elegant dessert for a Christmas Eve open house!! Thanks, Jenni!! I am so pleased, Susan! I love to think of my recipes inspiring others to make them and share them with their loved ones. Enjoy! PS You really can’t go wrong with Trader Joe’s! 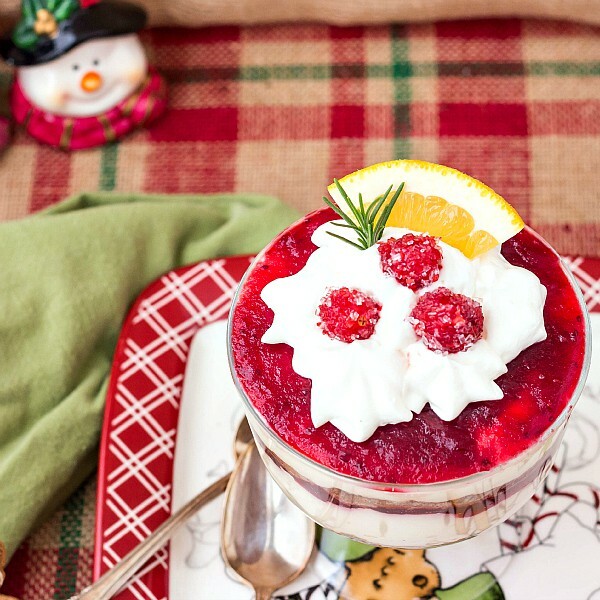 This is truly the perfect dessert for the holidays!! And I have the perfect ginger cookies to turn into crumbles! Ho Ho Ho! Nobody has the obligation to feel happy and festive when the holidays come, especially Christmas. Thank you for sharing your story! Ahhhh I’ll the the manhattan option: it looks fa-bu-lous!